Hi everyone! Before I leave tonight (tonight! TONIGHT!) for Amsterdam, I thought I would post a quick DIY about a craft I made a while ago. I made it before I even created CanvasAndCrumpets, which is why I never thought to write about it before. But it’s an item that has stayed with me through three years of university, and never fails to impress all who walk into my room. ( “Oh my God did you make that?” is probably my favorite sentence in the english language ). That item, ladies and gentlemen, is a jewelry board. Step 1: Lay out a ton of newspapers and put some Billy Joel on Spotify. Step 1: Sand the frame until it is soft and smooth. Step 2: Paint the frame and a piece of cork board with two coats of acrylic paint. Let dry for an hour between coats. Step 3: When dry, coat the frame with a clear glossy acrylic coating. Let dry overnight. Step 4: Flip your frame onto its back. Measure the length and width not of the frame itself, but the picture that is meant to go inside. You can also measure the cheesy stock photo that probably comes inside your frame. Step 6: Smear wood glue all over the inside of the frame. Fit the cork board on top. It should fit as if you are putting a picture inside the frame. Step 7: Place some heavy book on top to keep the frame and cork together while the glue dries. Let dry at least overnight. Step 8: Turn your frame over. It should be completely connected the cork. Start putting in thumbtacks where you would like to hang jewlery. 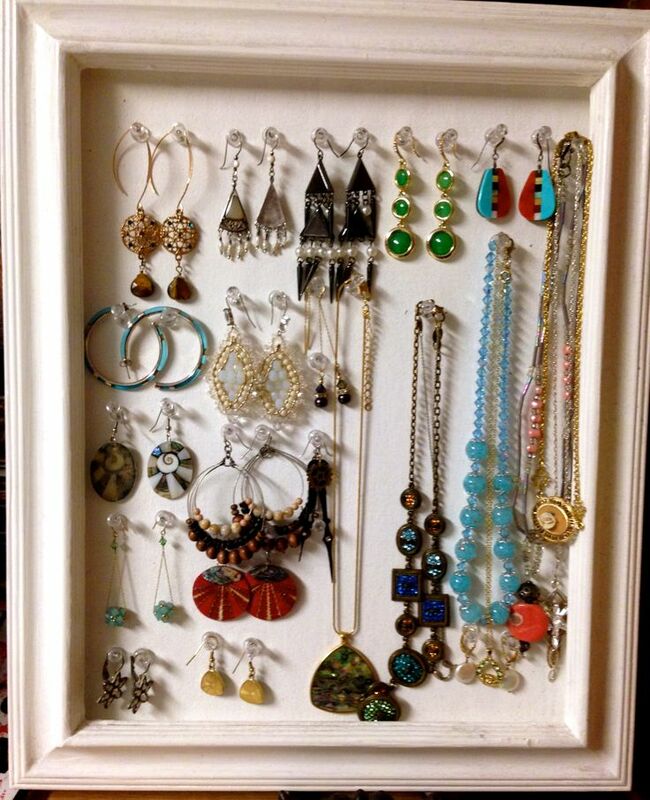 The nice thing about this is you can hang the tacks wherever you want- super high to accommodate a long necklace, or really close together if you have a ton of short earrings.